Sometimes creativity in an art form like photography can be sparked by an assignment, whether commercial, for a portfolio project, or even a "self-assignment" to (just as an example) find ways to depict a concept with an image. I recently did a little study on "black on black". Strictly speaking, black is the absence of all light, but when you look at a black shoe or any other object that we would all likely describe as black, it's pretty obvious that you're seeing more than just a void in your field of vision. All objects reflect some light. We tend to classify things that reflect much less light than most of the other things around them as black, and expect to see variation in brightness. That's the only way we can perceive the shape and texture of the object. A photograph may theoretically show shapes purely through variation in color, but in reality it's bound to have variation in brightness as well, which is what gives us a sense of form. If you completely remove color from the process, then you're left with a so called "black and white" photo. Of course, only something like a line drawing would really be limited to two shades that we might call black and white. Photographs make use of a full range of tones (gray, if there's no color involved), and we call the darkest one in the range of that particular image "black". This is where the challenge of depicting "black on black" comes in: there has to be variation in tone to show anything at all, but we want to create an overall sensation of blackness. To an extent, our vision adapts to the tonal range of any area that we examine in isolation, so that we "see" the brightest tone in a "canvas" as white, the darkest as black, and relate all the rest to those benchmarks. That's why the approach to creating a "black on black" photograph needs to involve choosing a subject and background that will be mostly dark, but with texture and shapes that are interesting. Then we need to light it in such a way that the few areas that are brightest in this otherwise dark composition are placed in the top of the range of brightness that our medium can reproduce. 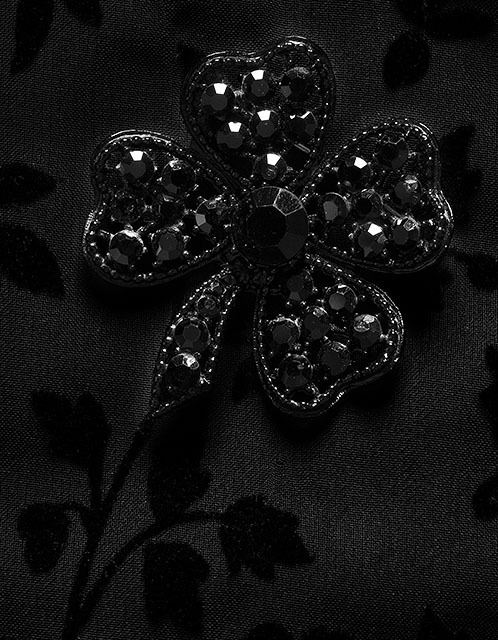 Here is a black rhinestone clover, placed on a black fabric with a somewhat similar leaf pattern. I've lit it so that only a few of the reflective facets catch the light, giving us our white benchmark, and the fabric texture is captured by the side lighting, but the majority of the area of the image falls in the darkest part of the tonal range that can be shown. If you are viewing this on a properly calibrated monitor, you should see texture and shading even in the darkest parts of the image, but the overall impression, I feel, is blackness. In a print, the feel of rich darkness is perhaps even greater, and of course there is a tremendous amount of detail and dimensionality that can't be shown in a web image.